I’ve been stalking Fork Spoon Knife for a while—a gorgeous food blog authored by Asha which is full of beautiful food photography and excellent recipes. Hailed from India and currently resides in New York City, Asha is pampered by two generations of talented cooks in the family. As such, Asha has a discerning palate and love to cook and entertain friends and family. Please welcome Fork Spoon Knife with her South Indian Chicken Biryani recipe, one of the most requested Indian recipes on Rasa Malaysia. Biryani is typically a special occasion dish, for many reasons. This dish is particularly known for its many layers of flavors that slowly develop and meld together. The concept of the Biryani came from Persians. When the Mughals conquered Northern India, they introduced much of their cuisine to the populace. As their rule spread further South, most Indian were exposed to the delicacy and it took a firm place in every Indian’s heart. And, then, every region of the country adopted the dish as its own and lent a distintive flavor and taste to it by modifying the ingredients as also the method based on the indigenous cuisine. Over time, a distintive difference developed between the Biryani as it is served in North India (that is only a slightly modified version of the Persian original) and that in the South, especially, Keral and Tamil Nadu, which, has been significantly modified to suit the Southern Palate. Particularly, in the South, the meat is cooked in a coconut infused curry and the rice and curry are mixed rather than layered, as is typical with the Persian version. The good thing about the Biryani is that the components can be made ahead and it tastes even better the next day as the flavors have more time to develop. So happy to see the chicken biryani recipe here. I love it, have been searching for a good recipe. Going to make it. Yay, Asha! That is one beautiful biryani, and the onsen egg is an unusual, classy touch. My wife prepared Chicken for the first time yesterday and I must tell she is a natural,it was like she has done over and over.OOh I love byrani and curry. and what gorgeous eye-nicely done as well and photograph. I miss a good chicken briyani and glad i can use this to help me create a similar dish in the kitchen. So happy to see Chicken Biryani. I have always been mystified about this dish. It’s so gorgeous I assumed it was hard to make. Glad to know you can make this dish ahead of time! Where can I get ghee? What is a good substitute if I can’t find it. Love chicken biryani and can’t seem to find it where I am. It is best if you make your own ghee. Store the ghee in an air tight container in a dry location. Ghee does not need to be stored in the refrigerator and can last for about a month. Be careful not to rush this because butter can burn very easily and the more patient you are the better the results will be. Get regular butter 1kg, cook in pot on medium heat till it liquifies and becomes glassy, reduce heat and add 100ml cold water, this helps make ghee separation easy. Some debris forms at bottom, you may filter this out, and allow to cool. this will cool down as ghee! 15-20 mins perp time. Hey Shirley, You can find ghee in any Indian store, or better yet make it easily at home. It’s clarified butter. So, it’s just brown butter strained off the brown bits. Yes.. I make it this way. as in my country you cant get good ghee. Brown the unsalted butter in med-high heat. Let the butter melt and come to a boil. This should take about 2-3 minutes. Once the butter comes to a boil reduce the heat as so you do not burning it. The butter will form a white foam on top which will disappear. Keep the heat going and a second foam will appear and the butter will be golden brown, that is when ghee will be done. This process should take about 7-8 minutes. Thanks Asha. Going to make it today….. This looks so delicious. I just saw the briyani recipe from mylittlespace and now here. It’s a sign, I think I need to make briyani to satisfy my craving soon. I’m drooling….great looking photo and recipe. Looks so scrumptuous!My Irish husband loves Indian food and this recipe will go very well with him and friends as we entertain a lot.Can I substitute ghee with something else?I dont think I can get ghee easily in the Middle East. Hey Sensatiom, You can substitute with 50-50 combination of clear vegetable oil and butter. You can also make ghee at home, as I said before. THis is my fave basmati rice dish! I learned it from my husband’s grandma who’s Indian. I, too, have noticed that this is the only dish that contains hard-cook in Indian cuisine. WHy is that? When I saw the lime wedges, I immediately thought of the Dum Biryani I have tried. Your dish looks so delicious. 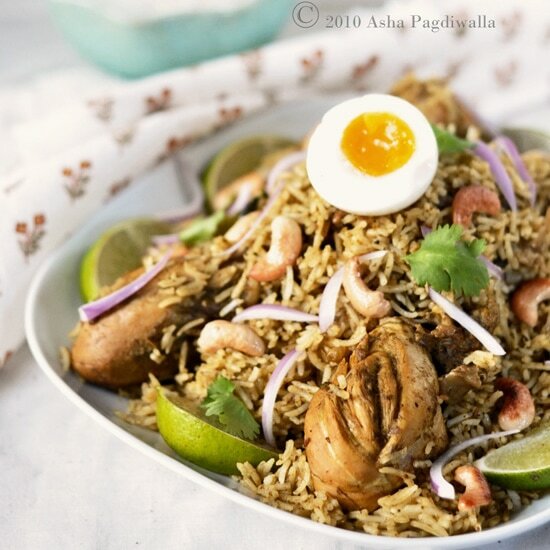 chicken biryani is one of my favorite dish.I really happy to see the recipe here. It’s look yummy. cilantro is what? thanks for the recepy i wil make sure to try do it yummy! What is cilantro?? Have you never heard of Google?? (Meanwhile, prepare the rice. Roast the whole spices in ghee and the saute the onions in the same. )can you explain this part to me? roast the whole spices in ghee and the saute the onions in the same what??? pan or roasting pan?? Where is the 5 1/2 cups of water used in the rice recipe? Is this poured over the raw rice along with the curry before baking? Hey…. come to india, come to lucknow eat biryani with biryani inn home delivery lucknow, its tasty non greasy yet mild spicy biryani which will leave its taste in your mouth for long. I’ve made this twice now. The first time I followed the recipe as stated, except I reduced the mint to about half of what it called for, as it just seemed like way too much. It still ended up tasting of nothing but mint. The second time (today), I left out the mint entirely, and it’s delicious! I also just used butter instead of ghee (too lazy to make ghee today). So I would definitely recommend this recipe, but leave out the mint! I made this dish yesterday and it turned out beautifully like many of your recipes :) I was wondering, if I wanted to increase the heat of this dish (spiciness), what would you recommend I add to the recipe? Hi, I made the recipe and it came out well. I have a few suggestions if you feel like editing it. I think the most important thing is to say how much cilantro to use (maybe specify a weight). I used a “large bunch” and my curry and biryani are VERY green and do not look like your photo. Maybe my large bunch (in the U.S.) is larger than elsewhere? I figured out that “grind together” meant to use a food processor or blender (usually grind = mortar and pestle for me) but wasn’t sure what to do with the roasted whole spices in the deep bowl since I thought maybe they were different from the dry spices. (I later dumped it all in.) Also, add “salt” to the rice ingredients to match the instructions. Thank you! How long will the entire process take ? Hi Asha, thanks for sharing this wonderful recipe with us. Can you please specify what “T” is in the ingredient? Is it teaspoon or tablespoon. I have never tried vegetable biryani before. Thanks for sharing this recipe. Mmmmmmmmmmm yummy , Must be a wonderful dish full of flavour. Your pot looks beautiful and I wish I was a guest at your party ? I love any kind of Biriyani. want that right now! ? It looks incredible. I’m going to try it. Love a new recipe – thanks. ?